I should be writing my Sunday Morning blog post on TGC but I thought I’d put this here as it will focus on the one thing, the Relics Reinforcements 2 project that’s happening on a new Crowd-funding website called ‘GamingFunder‘, and yes it’s just for us gamers! So that means it should be quicker to find some new things and cheaper that only Crowd-funding websites for these ideas… more about that in another blog soon, but they do have a Facebook page if you want more news. 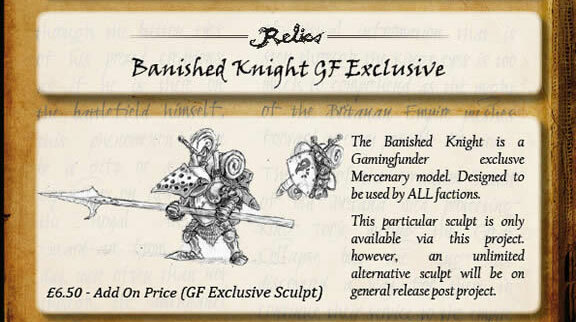 Help to fund the production of the Relics profiles remaining from the current rulebook. On top of that, there will be project exclusive mercenary sculpts usable by all factions! So the starting target is £1200 ($2021USD) and it’s all ready reached that (after about 26 hours), and is now around 21% into the first Stretch Goal which will mean the HUGE Neum profile will have its model, the Ruina. Now that’s not a huge total but it’s enough to get the project started. Looking at the rule book and the project these are the profiles that still need models and here’s a nice list of them (by faction). That’s a total of 10 profiles to fund which isn’t going to be a easy task as Relics isn’t stocked everywhere (but is slowing growing). It therefore needs our help. Looking down the various pledges it appears to be aimed at the new players as you can pick up a full army for £75 (available at this time) which is around $126USD and that price includes shipping! That’s not a bad price for a large range of metal/resin models that won’t be a light package to send. However the project hasn’t started with any of the remaining profiles, nope it’s done something better. Scenery! We’ve been after having some Relics scenery for our gaming boards for a good while and it’s nice to see something has happened. First up comes some Portals. These look good and will be useful for some games we play. Next we can see that there’s a new profiles as well, a Mercenary that can be used by any faction. I like that idea a lot and I like the figure that they’re giving to us if you back the project. Look at him (it or her). Looks very great don’t you think? It’s going to cost £6.50 to add in but that’s one. If you look at the project you can find his rules, but because this is a new profile (and it’s being tested) those rules/points/profile might change, don’t worry he’ll look very good on the table. Next then we come to another Mercenary figure that they’re going to sell only for Tor Gaming Events, the Chronicler. I don’t know much about this chap, but he looks very good as well. So what’s next? Well time to back it I think, plus look at all the add-ons (for their current models) and make a new army. I’m thinking of getting a Neum army (I have Britanan already) and pick up the Mercenaries figures, from what I can see the £75 is still there, cool. Also now just looking at the Stretch Goals and read an Update to say this will be changed, but down on that list are Objective Markers as well, now look at this guys! WOW, just look at the Britanan Marker, lol, very good I think, very good. Got to love the Orcnar one as well and look forward to hopefully being able to buy a Neum for my new army. Anyway if you want to find out more about Relics try first signing up to their forum here, and then have a look over at the Tor Gaming website. Right I’ll be back in a few days, going to play some more Netrunner games and some Relics games I think!